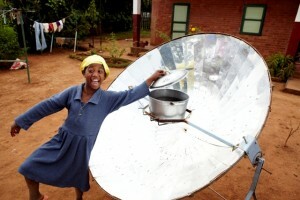 This project allows over 700 children to attend school and receive a hot meal each day! 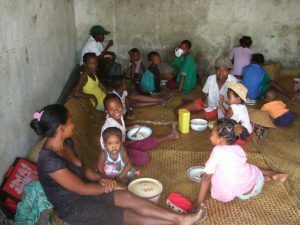 Chronic malnutrition affects half of children under age 5 in Madagascar, placing the island among the six countries in the world with the highest rates of malnutrition. Chronic malnutrition is a problem linked to poverty, with many repercussions on education. 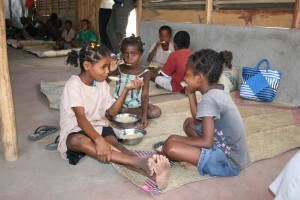 Parents of low income families often find themselves faced with choosing between educating their children or feeding their children, and decide often not to send them to school. Thus, in Madagascar, 1.5 million children do not attend school. Moreover, more than 2 million of Madagascar’s youngest children do not attend preschool. This project responds to two fundamental needs of children born into poor families: being able to eat, while also having the possibility to go to school like other children. 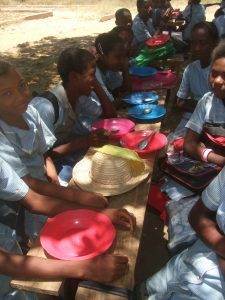 To allow children to do both, 7 school cafeterias have been opened in Madagascar by the organization Les Enfants du Soleil (Children of the Sun). The organization takes responsibility for the operations of the cafeterias and contributes to the school fees children must pay. This project allows children to get both an education and a daily meal. Humanium is working closely with Les Enfants du Soleil to operate 3 school cafeterias in Toliara: The Cafeteria AMIKA, serving 255 children, the Cafeteria of Tsimenatse, serving 225 children, and the Cafeteria of Mahavatse, also serving 225 children. To respond to the needs of these 705 children, this project, with the additional partnership of the United Nations World Food Programme, aims to provide food products (such as rice, corn, oil, various flours, and sugar), fresh foods (such as vegetables and meats), as well as necessary equipment for running the cafeterias (such as ovens and wood) and supervisory staff for two years. This project also closely involves the parents of children at the school, who are responsible for preparing and serving the meals. Ensuring that children receive meals at school means that parents do not have to make the difficult choice between feeding and educating their children, and are even more motivated to send them to school rather than keep them at home. Thanks to these 3 school cafeterias in Toliara, 705 children have at least one meal served to them each day at school, combating nutritional deficiencies that they may have otherwise developed. This allows these 705 children to grow up in better health and receive a normal education. The children receiving these meals attend school and are motivated and attentive in class. Moreover, this project creates a social connection between families and the school, meaning that parents are more motivated to send their children to school. In this way, this initiative brings together the pleasure to learn with the possibility to share a meal with classmates, contributing to the intellectual and physical development of children. It is succeeding in creating a social link between schools and families. We need your help to educate and feed these children. You can make a donation to change the lives of these children and to offer them a better future!